1کارشناس ارشد، گروه مشاوره، دانشگاه آزاد اسلامی، واحد خمینی شهر، اصفهان، ایران. مقدمه: روانشناسان معتقدند که توجه به عزت‌نفس و شادی پرستاران می‌تواند اثر مثبتی در انگیزش آنان برای انجام وظایف محوله داشته باشد. هدف این پژوهش بررسی اثربخشی کیفیت زندگی درمانی بر افزایش شادی و عزت‌نفس پرستاران شاغل در بیمارستان دولتی شهدای لنجان زرین شهر بود. مواد و روش‌ها: پژوهش از نوع نیمه تجربی با طرح پیش‌آزمون- پس‌آزمون با گروه کنترل بود. جامعه آماری پژوهش راکلیه پرستاران شاغل در بیمارستان دولتی شهدای لنجان زرین شهر در 96-1395 شامل می­شدند. با روش نمونه‌گیری در دسترس نمونه‌ای به حجم 30 نفر انتخاب شد (گروه آزمایش=15 نفر و گروه کنترل=15 نفر). گروه آزمایش 8 جلسه مداخله درمانی هفتگی 60 دقیقه‌ای را دریافت نمود اما گروه کنترل مداخله‌ای دریافت نکرد. ابزار جمع‌آوری داده‌ها، پرسشنامه شادمامی آکسفورد و عزت‌نفس ﮐﻮﭘﺮ اﺳﻤﯿﺖ بود. داده‌های پژوهش با کمک روش‌های آمار توصیفی و تحلیل کوواریانس تحلیل شد. یافته‌ها: نتایج پژوهش نشان داد که در مرحله پس‌آزمون تفاوت معنی­داری بین گروه‌های آزمایش و کنترل در افزایش نمرات شادی (002/0=p) و مؤلفه‌های آن شامل: (خشنودی از زندگی (011/0=p)، خلق مثبت (00/0=p)، سلامت (00/0=p) و کارآمدی (001/0=p) وجود دارد. 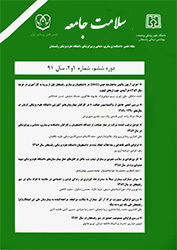 در عزت‌نفس (002/0=p) و مؤلفه‌های آن شامل عزت‌نفس اجتماعی (002/0=p) و عزت‌نفس خانوادگی (001/0=p) نیز تفاوت معنی­داری بین گروه‌ها مشاهده گردید. نتیجه‌گیری: بر اساس نتایج این مطالعه درمان کیفیت زندگی که از ترکیب روان‌شناسی مثبت نگر با رویکرد شناختی-رفتاری شکل گرفته، می‌تواند عزت‌نفس و شادی پرستاران را افزایش دهد. 1MSc, Dept of Consulting, Islamic Azad University, Khomeini Shahr Branch, Isfahan, Iran. 2Assistant Prof, Dept of Social Worker Group, Islamic Azad University, Khomeini Shahr Branch, Isfahan, Iran. Introduction: Psychologists believe that paying attention to the self-esteem and happiness in nurses can have positive effects on motivating them to perform their duties. This study was conducted aimed at investigating the effects of quality of life therapy (QOLT) on increasing happiness and self-esteem among nurses at the public hospital of Shohadaye Lenjan in Zarrinshahr City. Material and Methods: The research has a quasi-experimental and pretest-posttest design with a control group. The statistical population of the study consisted of all nurses working at the Public Hospital of Shohadaye Lenjan in Zarrinshahr City in 2016. A sample comprised of 30 individuals was selected using the sampling method (the experimental group and the control group consisted of 15 individuals each). The experimental group received eight 60-minute sessions of weekly interventions, but the control group received no intervention. Data were collected using the Oxford Happiness Inventory and Coopersmith's Self-Esteem Inventory. The data were analyzed using descriptive statistics and the covariance analysis. Results: The results of the study indicated that there was a significant difference between the experimental group and the control group in terms of the increase in the happiness scores (p=0.002) and their components (i.e. life satisfaction (p=0.011), the positive mood (p=0.000), health (p=0.000), and efficacy (p=0.002)). Also, there was a significant difference between the two groups in terms of self-esteem (p=0.002) and its components, including social self-esteem (p=0.002) and family self-esteem (p=0.001). Conclusion: According to results of the current research, the quality of life therapy as the combination of the positive psychology and the cognitive behavioral therapy can increase happiness and self-esteem among nurses. Joslin L, Davis C, Dolan P, Clark E. Quality of life and neck pain in nurses. IJOMEH 2014;27(2):236-42. Bernal D, Campos-Serna J, Tobias A, Vargas-Prada S, Benavides FG, Serra C. Work-related psychosocial risk factors and musculoskeletal disorders in hospital nurses and nursing aides: a systematic review and meta-analysis. IJNS 2015;52(2):635-48. Hu J, Liu H. Job satisfaction among nurses in China. HHCMP2004;17(1):9-13. Guha M, Carson J. Positive psychology, utilitarianism and the pursuit of happiness. Taylor & Francis 2014;23(4):159-61. Pritchard M. Does self esteem moderate the relation between gender and weight preoccupation in undergraduates? PID 2010;48(2):224-7. Argyle M. The psychology of happiness. 3nd ed. Londen: Routledte;2013:75-9. Gracia-Gracia P, Oliván-Blázquez B. Burnout and mindfulness self-compassion in nurses of intensive care units: cross-sectional study. HNP 2017;31(4):225-33. Provencio-Vasquez E, Mata HJ, Tomaka J, De Santis JP. Depression, Self-Esteem, and Childhood Abuse Among Hispanic Men Residing in the US–Mexico Border Region. JANAC 2017;28(5):795-806. Frisch M. Finding happiness with Quality of Life Therapy: Appositive psychology approach. 2nd ed. New York: Wood Way; 2006:114-23. Proulx CM, Helms HM, Buehler C. Marital quality and personal well‐being: A meta‐analysis. JMF 2007;69(3):576-93. Blakemore A, Dickens C, Guthrie E, Bower P, Kontopantelis E, Afzal C, et al. Depression and anxiety predict health-related quality of life in chronic obstructive pulmonary disease: systematic review and meta-analysis. International journal of chronic obstructive pulmonary disease 2014;9:501-12. Dai Q, Chu R-X. Anxiety, happiness and self-esteem of western Chinese left-behind children. Child abuse & neglect 2016;11(4):109-112. Diener E. Money and happiness: income and subjective well- being across nations. 8nd ed. NewYork;2000:55-9. Mitchell J, Stanimirovic R, Klein B, Vella-Brodrick D. A randomised controlled trial of a self-guided internet intervention promoting well-being. CHB 2009;25(3):749-60.